Registration for the 2019-2020 Season will open Sept 2019, thanks. Free t-shirt with every registration. Wrestling singlets are available from the club. A $50 deposit check is required for each and will be held until the end of the season. The check will not be cashed if the singlet is returned in proper condition. Make checks payable to Stallions Wrestling. Parent volunteer hours are required. A $50 deposit check is required and will be held until the end of the season or until volunteer hours have been met. Volunteer opportunities will be added to the website when available. Make checks payable to Stallions Wrestling. Adidas sponsorship! Exceptional apparel items for purchase and discounts on the best shoes in the sport! Once the apparel store is ready it will be provided to all registered wrestlers. New Board Members! Be sure to check out the Board Contact page for a directory of who’s who and who to contact with questions. Early season: TBD. Stallions Tournament, Stallions Night, open events (coach attended), joint practice events, end of season root beer float party, tubing at Mt. Kato and more! **New Early season practice schedule: 6-7pm for 1st and 2nd year wrestlers. All others advance to the late session 7:15-8:30pm. Exceptions and adjustments made as needed based on ability and desire. Please contact Greg Larson or Derek Bush with questions. Chaska Stallions competed at the NYWA Team State Tournament and finished in 9th Place out of 32 Teams. The Stallions went 4-1, losing only to eventual Champions Northfield. The won three of their four matches in come from behind fashion, with pins by Prentiss Derrick JR at Heavyweight. CONGRATS STALLIONS on an AWESOME YEAR!!!!! 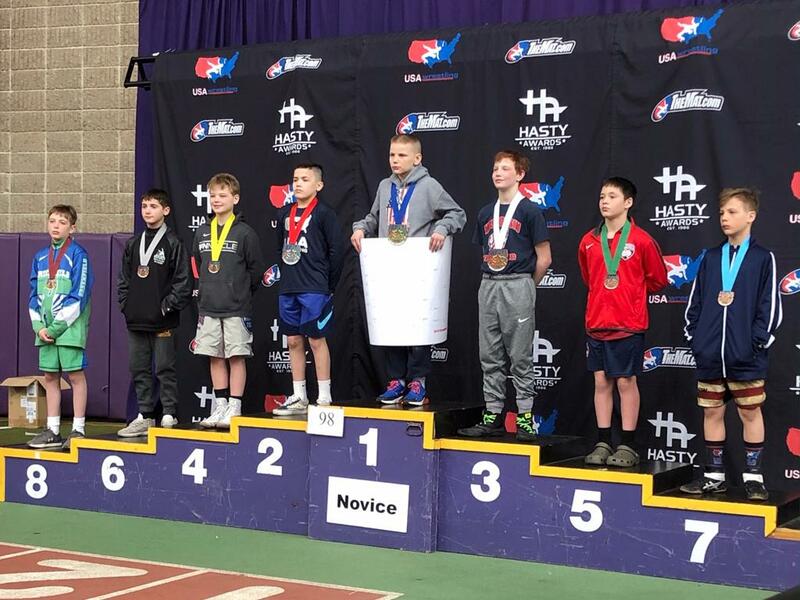 Michael Gillette placed 4th at the Cliff Keen USA National Wrestling Championships... The competition featured state champions from around the US. With Michael's 4th place finish, he obtained All American statues. What a great achievement. Congrats Michael. Stallions Wrestling is an U.S. 501(c)3 non-profit organization. ©2019 Stallions Wrestling / SportsEngine. All Rights Reserved.